This is the 6th summer of the Young Composers Project where your piano kid will get to expand their music learning into a new and exciting direction! During this project, students will learn composing technics and theories, and will be coached through creating an original piece. 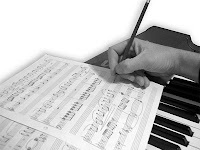 Each student will each publish their notated sheet music and an audio recording as part of our studio book & album. At the end of the project, each student will receive the book and CD/digital download of all the compositions.